Extract geospatial (x,y) coordinate information embedded within a JSON hierarchical data structure. Use the flatten() function to remove nested data.frames from data imported in JSON format. Create a map of geospatial data using ggmap(). 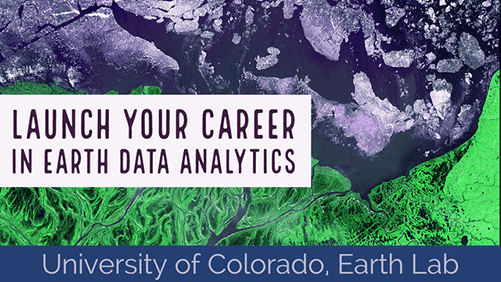 In the previous lesson, you learned how to work with JSON data accessed via the Colorado information warehouse. In this lesson, you will explore another dataset however this time, the data will contain geospatial information nested within it that will allow us to create a map of the data. Check out the map Colorado DWR Current Surface Water Conditions map. If you remember from the previous lesson, APIs can be used for many different things. Web developers (people who program and create web sites and cool applications) can use API’s to create user friendly interfaces - like the map in this link that allow us to look at and interact with data. These API’s are similar to - if not the same as the ones that you often use to access data in R.
In this lesson, you will access the data used to create the map at the link above - in R.
The data that you will use are located here: View JSON format data used to create surface water map. 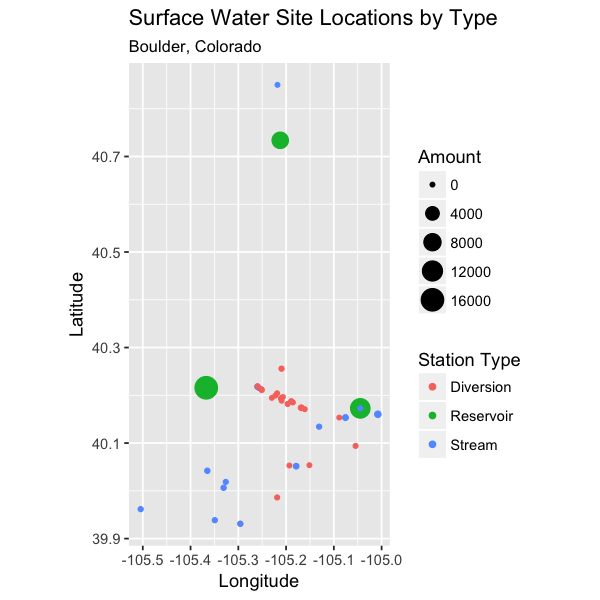 And you can learn more about the data here: View CO Current water surface . ATTENTION WINDOWS USERS: We have noticed a bug where on windows machines, sometimes the https URL doesn’t work. Instead try the same url as above but without the s - like this: water_base_url <- "http://data.colorado.gov/resource/j5pc-4t32.json?" This change has resolved many issues on windows machines so give it a try if you are having problems with the API. Remember that the JSON structure supports hierarchical data and can be NESTED. Next, let’s look at the structure of the data.frame that R creates from the .json data. In this case, you have a data.frame nested within a data.frame. ##  "40.256031" "40.255581" "40.15336"  "40.215772" "40.193757" "40.18188"
##   "40.256031" "40.255581" "40.15336"  "40.215772" "40.193757"
##   "40.18188"  "40.187577" "40.19932"  "40.174844" "40.214984"
##  "40.18858"  "40.134278" "40.20419"  "40.173949" "40.172925"
##  "40.21804"  "40.153341" "40.21139"  "40.1946"   "40.170997"
##  "40.160347" "40.21905"  "40.21108"  "40.193018" "40.172677"
##  "40.172677" "40.19328"  "40.18503"  "40.051652" "40.006374"
##  "40.053036" "40.733879" "40.849982" "39.98617"  "40.042028"
##  "40.018667" "40.09404"  NA          "40.05366"  "39.961655"
##  NA          "39.938598" "39.931096" "39.931099"
Now you can clean up the data. Notice that your longitude and latitude values are in quotes. What does this mean about the structure of the data? Notice in the code below that there is an addition pipe that removes NA values (missing latitude values) from the dataset. You want to create a map of these data. You will not be able to map points with missing X,Y coordinate locations so it is best to remove them. # where are the cells with NA values in your data? Note, in the code above, you can identify each location where there is a NA value in your data. If you add an ! to your code, R returns the INVERSE of the above. # where are calls with values in your data? Thus in your dplyr pipe, the code below removes all ROWS cells with a NA value in the latitude column. Plotting the data using ggplot() creates a scatterplot of longitude and latitude, with some minor aesthetic tweaks. You really want to create a web map like the Colorado DWR Current Surface Water Conditions map. You can create a non-interactive version of this map using the ggmap() package in R. You used ggmap() earlier in the semester. It provides an efficient way to quickly draw a basemap on the fly. You can overlay your data on top of that basemap to create a nice static map. In the next lesson, you will learn how to create interactive maps using the leaflet package for R.
Why you should use JSON instead of csv.